Interactivity is as essential to any presenter be it in the classroom or training workshop as water is to the thirsty man. It is a medium of instant and rapid communication, exchange of ideas, teaching a concept/process with the help of an interaction model, etc. The flagship interactivity building software, Raptivity in its latest Flexi avatar was launched last week. The version 6.5 is ready to embark on all endurance tests with its new advanced features which will set new benchmarks in rapid interaction creation. The launch webinar presented by Jill and Jamaica did pull in a commendable audience. The webinar started off with Raptivity v6.5 in action and the approach which makes it simple to practice and preach. 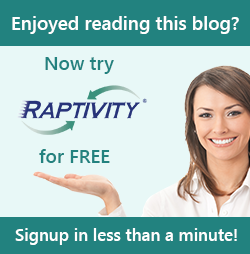 Raptivity v6.5 was not only showcased but also plenty of queries were answered. Wow, looks like it is gathering momentum and people are curious to try it out. In case you missed the action, here is a recap of the webinar. The Figure 1 given below brings out the essence of Raptivity. With an already prebuilt library of +245 interactions, Raptivity Approach is pretty simple and straight forward. You are given a collection of interactions to Select, Customize, Save and Use. The extended flexi features are just one set of possibilities apart from the new interactions added to the existing library. Q: Is the Media Toolbox included in Zest upgrade? A: Yes, Zest supports media toolbox. Q: Is adding video new for 6.5? A: Adding a video through the Media Toolbox is a new feature in 6.5 and the number of templates and components in each template with the option of including a video file has greatly been increased. Q: Can videos be included in the flip book? A: Yes, you can insert videos in the Flip the Book template in the Essential Pack and also the 3D eBook in the 3D TurboPack. Q: Since Apple products do not allow the viewing of flash products, will we be able to export as an HTML5 file? A: Currently, we have a HTML5 TurboPack which provides a facility to output to HTML5 format. Rest of the packs support Flash output only. The webinar was for sure enriching for the participants and we all need interactivity in some form or the other. If you have missed it, don’t worry! Write to us at info@raptivity.com for the Webinar Presentation or you can watch the recording at Webinar.